Comments The distinct depth of color that is unique to Zambian Emeralds! What inclusions that are visible are the natural inclusions that are referred to lovingly as Jardins by gemmologists, and are proof that the gemstone is natural and unenhanced! 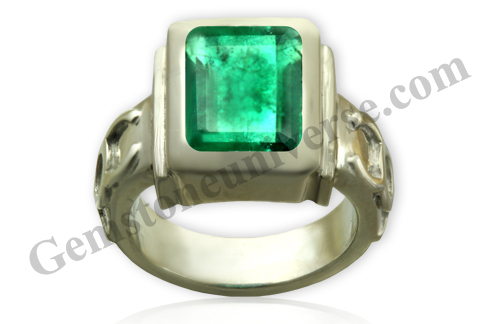 A bountiful gemstone with the traditional Emerald cut! Natural Emerald to empower yourself to strengthen Mercury, the planet of Business, Finance and Communication to bestow its gifts! Set in a sterling silver ring with the talismanic and ancient symbols of Mercury! A Sattvik and Jyotish power filled talisman!